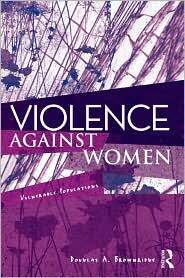 Violence Against Women: Vulnerable Populations is a book of collected researches by Douglas Brownridge. He looks at women in vulnerable positions that put them at risk for intimate partner violence, better known as domestic abuse or violence. It's an interesting read for anyone who works with women, especially in one of these vulnerable populations. I remember once I was working with a female client who was mentally ill (suffering from extreme bouts of depression), Aboriginal, living in a rural community (a reservation), who just got over a relationship and just moved into their new boyfriends apartment (implying a rental home); and I got concerned for her wellbeing because I remembered these categories being outlined by Brownridge as vulnerable situations for women. The client and I proceeded to implement safety plans into her network so that, despite her vulnerability, she could feel safe. Now of course, with any kind of risk factors, they are indicators, they do not guarantee that domestic violence is happening. A women could be married for 30 years, living in an owned urban house and she could be experiencing violence, despite not being in a vulnerable population. The same could be said about my previous client, despite the vulnerable position she was in, and without my assistance, she may have been in a violent free relationship. Everyone's system is different. No two people are alike, despite the similarity in scenarios. You can check out the book here, or learn about Douglas Brownridge here.